The Open Government Project – Hear the Bills! R3publicans: The US Ponders a Strike Against Syrian Government Forces: What’s Behind This Aggressive Approach? The US is considering the option of military action against Syria. The alleged use of chemical weapons (CW) by the Syrian government, which is not backed by any solid evidence, is to serve as the pretext. Syrian President Assad is going to be “punished.” On March 6, US President Trump and Israeli PM Netanyahu discussed the threat posed by Iran’s presence in Syria and ways to counter it. It’s a program so effective that other states are seeking to copy it. It was featured on the local news last week as News 9’s Alex Cameron took his cameras inside the headquarters of Oklahoma’s new, unified IT entity. Cameron’s story, entitled “Keeping the State of Oklahoma Secure Against a Cyber Attack,” captured footage from the state data center and one of its situational awareness centers. The story features footage from the center’s real-time network monitor, a big board straight out of the movie War Games, which tracks potentially hostile incoming Internet traffic from sources around the world. Cameron’s footage showed the foreign probes, in real time, while they actually occurred. 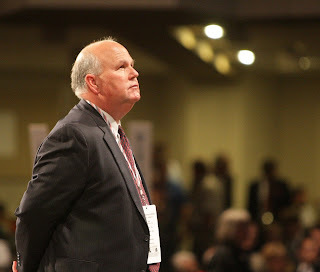 Gary Jones recently stepped in & rescued the OKGOP 2015 Convention from a near collapse, when the organization’s systems shut down the process on a 5 hour delay, with no credentialing solution. State Auditor, and former OKGOP Chairman, Gary Jones, is focusing significant efforts to improving the efficiency of the state government in his beloved state of Oklahoma. Some of that significant effort is now turned to communicating these ideas with his thoughtful fellow citizens.